The wheels on the bus go round and round! goes a popular children’s ditty. But what if the wheels stop turning? What if people stop breathing? Such are the questions that Suresh Ediga explored with his children when talking with them about such issues as the disaster in Bhopal, in which a pesticide factory exploded, leaking tons of toxic fumes, killing thousands instantly and poisoning the ground and water for decades. This makes the first story in his collection, You, Me & a Story. The family that reads together! From left, Sireesha, Suresh, Surina, Suhash each holding a copy of You, Me & a Story. When topics such as elections, unemployment, caste or industrial pollution come up, children often ask questions such as why did…? who said… ? what is …? how about …? If we don’t know the answer, we may change the subject. Worse, we may tell our children not to ask such questions. Even if we know (or think we know) the answer, we may think that our kids won’t understand it. And if we think they will understand it, we may be even more reluctant, because we want to protect them from the brutal reality of the world. These questions don’t go away, however. Do we really need to sidestep them? Should we? 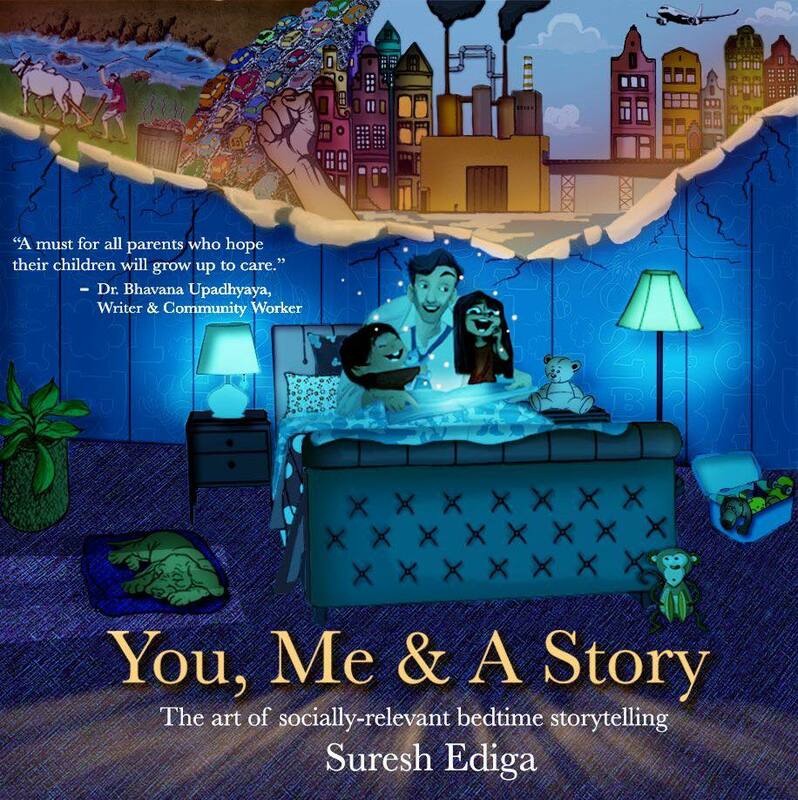 Designed for parents who would like to be more open to discussing social, political and environmental issues with children, the booklet offers real-life conversations that arose from the stories Suresh told. This is a book to read aloud, a jumping off point for more dialogue to evolve dynamically. In fact, I found myself talking back to the book. The fact is, that all of us, not only children, need more spaces when we can reflect on issues of poverty, injustice, civic responsibility and democracy. This is a book for all ages. I’d have liked to have it around when my daughter was younger. When she read about the Bhopal gas tragedy in a book called Wasted World, by Nick Arnold, she got scared at night. You, Me & A Story shows the crucial role of storytelling, not just reading, and building on the responses as the story goes along. Parents who read this book along with their children should be prepared for conversations that may take them far beyond the story. Maybe even into the streets. Next And yes, we persisted!